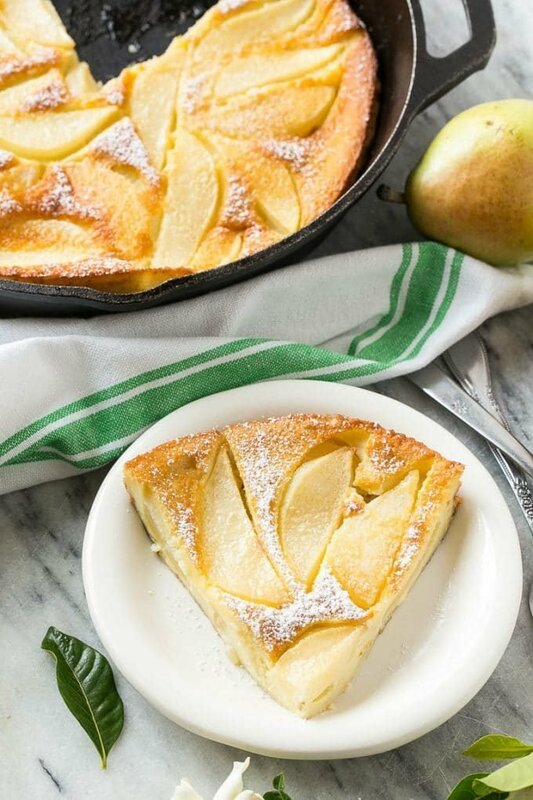 In this pear custard pie, fresh pears are combined with a rich and creamy 5 minute custard, then baked to perfection for a simple yet elegant dessert. This crustless pie is my absolute favorite way to enjoy pears, I make it almost every week during the fall months! I am not a huge fan of pears. I like them fine when they’re cooked but I don’t eat them raw, I think it’s the somewhat grainy texture that bothers me. A long time ago before we had kids a relative sent us a big box of those fancy mail order pears. My husband did his best to try and eat them before they turned to mush but it was just too many pears for him to finish. 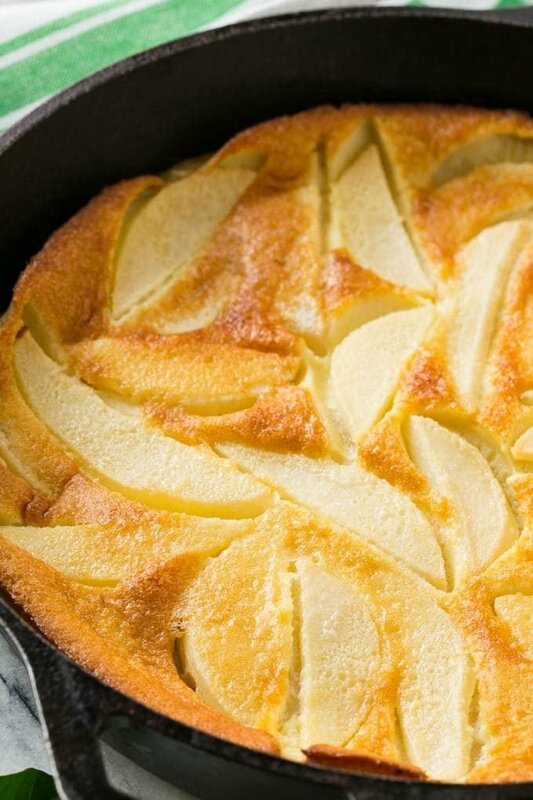 I made this pear custard pie to use them up and I have been making it ever since. It’s definitely my favorite way to eat pears. We go through a ton of produce in this house. 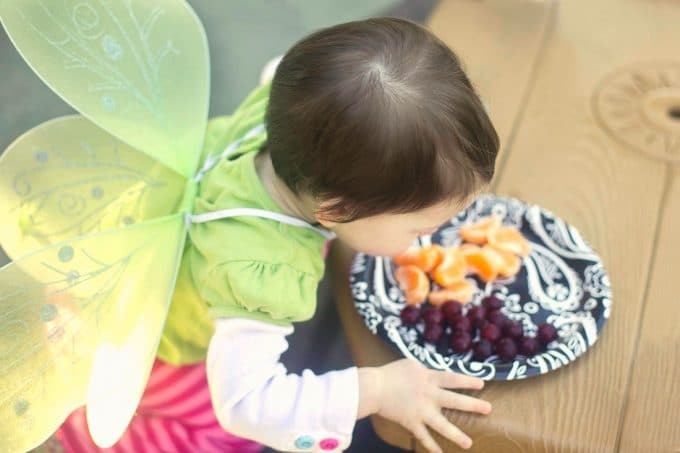 My kids are total fruit monsters and between the three of them they can polish off a whole pound of grapes or strawberries in one sitting when they’re in the mood. My mom often brings us bags of apples, oranges and pears to help keep our household well stocked in the fruit department. Some weeks we don’t get through all the fruit and that’s when I make pear custard pie. The beauty of this recipe is that it only uses pantry staples that you probably always have lying around. 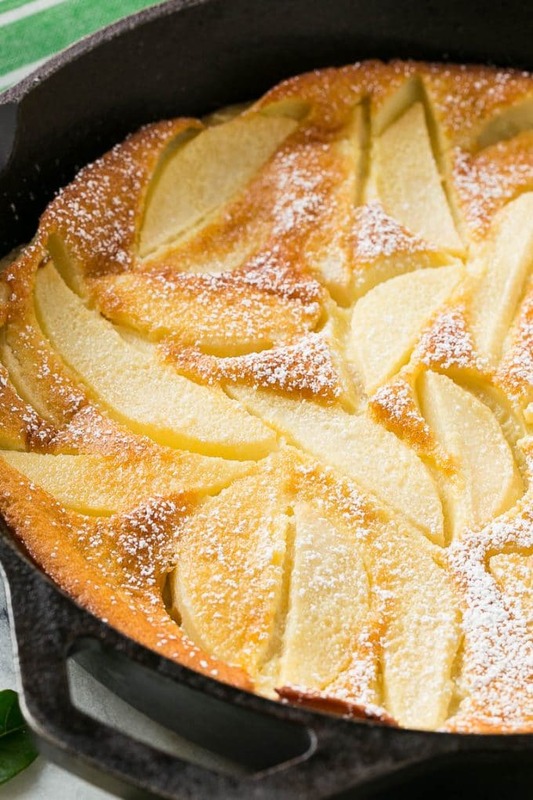 Which means that if you’ve got pears, you can whip this up whenever you feel like it. I’ve made it twice in the last two weeks! 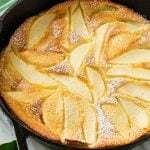 How do you make pear custard pie? The batter for this custard is made in the blender. After you peel and cut the pears, toss them in the dish and pour the custard over the top. That’s all there is to it, 40 minutes later you’ve got an amazing dessert. You can sprinkle some powdered sugar over the top if you want to dress it up for a special occasion. I’ve also put some cinnamon sugar on top which is great too. It probably comes as no surprise that the kids love this recipe. I’ve made it dozens of times over the years and it always gets rave reviews. It’s simple, but sometimes the simplest recipes are the best, don’t you think? Preheat the oven to 350 degrees. Coat a 9 inch round pan with cooking spray. Put the butter, eggs, milk, salt, granulated sugar, flour and vanilla into a blender; process until smooth. Pour the batter over the pears. Bake for 40-45 minutes until the custard is golden and firm to the touch. Dust the top with powdered sugar before serving. Little Helpers: The kids can help you measure and dump all the ingredients into the blender. 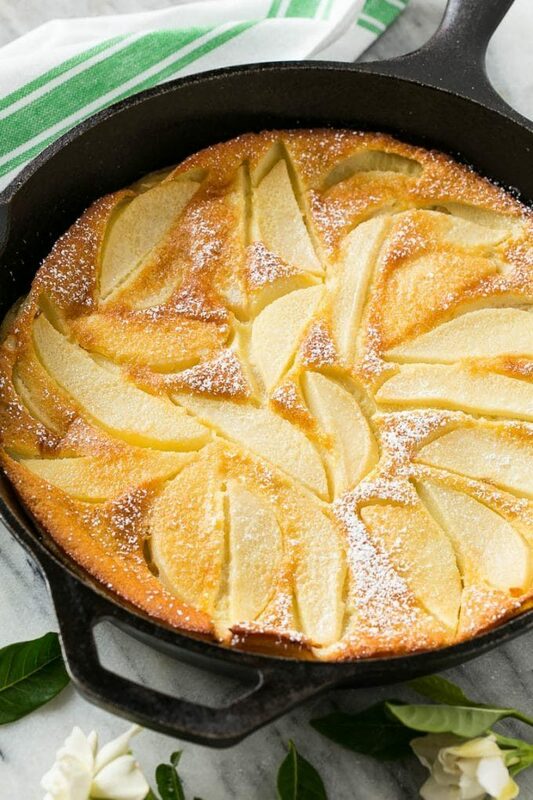 Can’t wait to make this pear custard pie. Since I don’t have a cast iron frying pan, do you think it would work to cook the custard in a cake pan or glass pyrex pie dish? And would you suggest any possible adjustments for either a cake pan or a pyrex pie dish, eg. such as lower or hotter oven temperature or putting the pan/dish in a shallow water bath? Yes I’ve made it in a glass pan before, no alterations needed to the recipe! I grated fresh ginger and pressed the pulp into a strainer to extract the juice and added 4 teaspoons to the custard mix. Fantastic? I’m wondering if this should be refrigerated after baking? Sounds great! I typically refrigerate it after it’s cooled if I’m not serving it right away. Hello- I look forward to making this recipe but only have a 12in cast iron skillet. Should I make any adjustments to the ingredients or does anyone have experience with this? Thanks!! You’ll need to cook it for less time and the pie will be a lot thinner in such a large pan. I’d try baking it for about 30 minutes. Surprised my husband with this today. It was incredibly easy to put together (go Vitamix), and smelled wonderful as it cooked. Puffed up nicely and tasted decadent! Thank you for this delicious change of pace recipe. This is a beautiful looking dessert. Can it be made with almond milk? This was delicious! Will definitely make again. My pears were fairly sweet, so next time I might try cutting the sugar back to 1/4 cup. Cook time was closer to 35 minutes for me. My kid’s going to love this! He loves pear so much. I’m going to try making this by the weekend. Hope I’ll make it right though. lol. Anyway, Thank you so much for sharing this! I made this tonight while my spaghetti was cooking. I used up pears from a Christmas fruit basket. Microwaved the butter in the milk and let it cool a bit while I loaded room temperature eggs and all the other ingredients in my Vitamix. Gave it all a quick high speed mix and poured it in a well buttered iron skillet topped with freshly grated nutmeg on top. It puffed up and browned perfectly. The pears didn’t rise to the top, but who cares? Could not wait for it to totally cool before we dove in. It was amazingly good, and I am not a big pear lover. Next time I will taste the pears to check for sweetness, as it could have used a bit more sugar for my taste. Will definitely make it again, and will certainly try one with rhubarb! So glad you enjoyed it, I love the idea of trying rhubarb! This is such a simple but versatile recipe. I felt guilty bringing it to a party as my dessert, but it was a huge hit . Very adaptable in terms of fruit, and substituting gluten and dairy free ingredients. I used coconut milk and decreased the sugar. Also decreased the baking time to get a firmer fruit texture, which I prefer. Can this be frozen? Is so, how should it be wrapped? I’ve never frozen this before, I think it would work ok but the pears might be a bit watery when you thaw it out. I would just bake it in a disposable metal pie pan, then tightly wrap it in foil or slide the pan into a gallon sized freezer bag. Can’t wait to make this. Two questions. Can it be made a day ahead? And what temperature is it best served at. Yes you can absolutely make it a day in advance! I’ve actually served this warm, room temp and chilled. I think it’s best warm or at room temperature. I had some pears on hand and share the opinion that this is one fruit I do not like to eat alone. So I went looking for a new recipe and found this one. Outstanding! Didn’t bother to peel the pears (lots of nutrients in the skin) and added a little sprinkle of cinnamon on top. Two of us could have polished this off in one sitting! Highly recommend. Haha, I flipped mine over onto a plate thinking that was why the pears are on top in your photo. Mine did not seem to float to the top. It is still beautiful and delicious! I took a photo, but don’t see how to add it. I used gluten free flour and baking Splenda and they worked fine as usual for most baking. Will make it again! So glad to hear you enjoyed it!! We are having the other half for ‘breakfast’ today! Added my rating too. I made this yesterday and to my surprise the entire family (2 adults, 4 teens) all loved it! 20 minutes into the baking time I realized I had left out the melted butter! I was worried, but it still tasted amazing! Thank you for sharing this recipe. So glad everyone loved it, thanks for reporting back! Would adding a dollop of cream cheese to the recipe completely wreck it? I’m wondering if that’ll combat the eggy flavor others mentioned. Beautiful recipe! I think it would be fine to add!! Absolutely delicious! Made this pie last night and my family loves it! Yay so glad to hear everyone loved it! I made this for Halloween night at our local club. I’m hoping it’ll be a big hit. It’s baking in the oven now and smells terrific. Hope you enjoy, Happy Halloween! You’re beautiful photography caught my eye for this recipe. A friend gave me a giant bucket full of pears from her dad’s tree. We’re not sure what kind they are, but they are hard pears. I used more than four in this recipe, and made it in a square casserole, and it came out perfect. I used unsweetened almond milk, and I substituted one of the teaspoons of vanilla for almond extract. Almond extract added a very nice touch to it. All in all, I love this recipe, and I love your blog. I’ll be coming back for more recipes. Thank you! So happy to hear you enjoyed it, thanks for coming back to comment! Hi, my pie was delicious but can I substitute pears for apples, peaches or bananas? Yes, apples or peaches would work great! Not sure about the banana, I think it might get overly mushy. Of our seven pear trees, only the seckel one predictably produces pears year after year, and this was a bumper crop year. Unfortunately our freezer is unpredictable, so hurried to make pies, tarts, quick breads to give to friends. This was delicious. As I only use recipes as ‘starting points’ due to dietary and pantry restrictions, this was excellent though made sure that certain ingredients and proportions were retained to maintain recipe integrity. The photo was ultimately what brought me to the site. What a gorgeous shot.